Last year a Kiribati man, Ioane Teitiota, claimed asylum in New Zealand, stating that his home island, which is on average just two meters above sea level, was becoming uninhabitable thanks to rising seas. So-called “king tides” routinely wash over entire portions of the archipelago. The court rejected Teitiota’s claim because he did not meet the standard international definition of a refugee: namely, someone who flees his or her home country for fear of persecution. His case gave a human face to a previously hypothetical and highly speculative discussion about the implications of climate change on migration. This is a subject I began studying in the mid-1990s, when fears of climate-driven refugees first began making headlines and The Coming Anarchy was required reading in the Clinton administration. Over the subsequent two decades, scholars have learned a great deal about the processes by which climate and migration interact and their findings are starting to make their way into policymaking circles. I have detailed many of these in my new book, Climate and Human Migration (please excuse the shameless self-promotion), but for those of you who only read executive summaries, here’s a quick overview of some of the big things we know. We can learn a lot from past experiences about what the future might bring. Recent history tells us there are three general ways migration patterns respond to climate. The first is that people may be attracted to particular climates, something called amenity migration (think of Canadians and Americans from northern states who retire to Florida). A second is that people who live in places with highly seasonal precipitation regimes often adapt by pursuing seasonal labor migration. In West Africa, for example, many young people migrate from countryside to the city and back each year, coinciding with the rains and the farming season. The third way, which receives the most media attention, is distress migration, which occurs following extreme weather events. The most common of these are floods, tropical cyclones, and droughts. Since climate change is expected to affect global precipitation patterns and increase the frequency and/or severity of extreme weather events in many regions, it is indeed reasonable to assume migration patterns will respond accordingly. That said, migration is a complex phenomenon. Climate can act as a catalyst for migration, but non-climatic forces give migration patterns their form. Peoples’ choices about whether or not to migrate, where to migrate to, and for how long, are shaped and constrained by cultural, economic, political, and social forces operating beyond the control of the household. Climate can act as a catalyst for migration, but non-climatic forces give migration patterns their form. Take the example of New Orleans residents displaced by Hurricane Katrina. Two years later, only about 60 percent of the former population had returned, and they were disproportionately older, wealthier, better educated, and had fewer dependents as compared with those who resettled elsewhere. The skyrocketing cost of housing post-Katrina had a lot to do with this but so did pre-Katrina economic patterns that left the poorest members of the city (often African-Americans and recent immigrants) living in the lowest lying, most heavily flooded neighborhoods. Another outcome was a post-Katrina influx of Latino construction laborers, who sought work in the rebuilding effort and many of which stayed. In short, socio-economic processes produced several different migration outcomes from one disaster. There is always a flood, storm, or drought happening somewhere, but relatively few such events lead to large amounts of migration. Why is this? Consider this example: Flood-prone Bangladesh is the poster child for environmental refugee fears, but a recent study found that, while there’s lots of migration happening there, floods have little to do with it. Surprised? Actually, Bangladeshis have always lived with the risk of flooding, to which they have been continuously adapting. A flood next year won’t make migration patterns much different from this year’s. Droughts, however, do trigger sudden changes in Bangladeshi migration, because they occur less often and there’s less capacity to adapt. A similar thing happens in Pakistan, where extreme heat stimulates more migration than does heavy flooding. There are two messages here. First, adaptation and targeted assistance reduce the likelihood of distress migration. Second, it’s the less frequent or less easily anticipated climate events we need to worry about most. Although we worry most about refugees flooding across international borders, climate-related migration usually takes place within countries. When it does, it presents significant challenges for governments, but cases where it has caused severe political instability are hard to find. Darfur is the most commonly given example, but this is off the mark. Severe droughts happen often in Sudano-Sahelian Africa, bringing rival groups like pastoralists and farmers into competition with one another for scarce water and fodder. But this doesn’t mean they immediately start killing one another. Empirical evidence from other parts of the region shows that local governance institutions are actually quite successful at resolving resource conflicts during droughts. It’s when outside government authorities meddle that these conflicts get out of control. So put the blame for Darfur where it belongs – on the Khartoum government, not on the climate. My advice to policymakers always begins the same way: If you don’t want to deal with unwanted climate-related migration, then deal with the root cause by curtailing your greenhouse gas emissions. But since this is currently an unpopular policy choice, we must expect there will be more climate-related migration in the future. We need not fear being overwhelmed by this migration, but should plan accordingly. Climate migrants become refugees only if we treat them like refugees. A first step is building adaptive capacity in the most at-risk populations, so that people won’t have to flee their homes like refugees. Proactive adaptation works, as seen in the Bangladesh and Pakistan examples above. Every place will have its own needs. Some might require technical or physical infrastructure; others might need assistance with economic development generally. If people still decide they want to migrate, that’s not such a bad thing. Research from West Africa shows the economic benefits that flow across social networks make migration itself a positive contributor to adaptive capacity in the source area. Where relocation becomes necessary, in most cases people will move within their home countries. Wealthier countries can assist financially and logistically with these transitions, and they should – left unassisted, displaced populations often slide into chronic poverty and social isolation, precursor conditions to violence and conflict. This is the pathway down which climate migration can become politically destabilizing. Consider it a choice between development assistance sooner or peacemaking later. Finally, there will be places like Mr. Teitiota’s country of Kiribati where people might have no choice but to move internationally. In those cases, we can help them move with dignity by providing access to regular labor migration programs and basic resettlement assistance. We shouldn’t force them to beg for asylum. They become refugees only if we treat them like refugees. Robert McLeman is an associate professor of geography and environmental studies at Wilfrid Laurier University. A former foreign service officer, he is also the author of Climate and Human Migration: Past Experience, Future Challenges, published by Cambridge University Press in January 2014. Sources: AEDT, AFP/ABC, Applied Geography, The Atlantic, Demography, Global Environmental Change, Nature Climate Change, Population and Environment, Proceedings of the National Academy of Sciences. 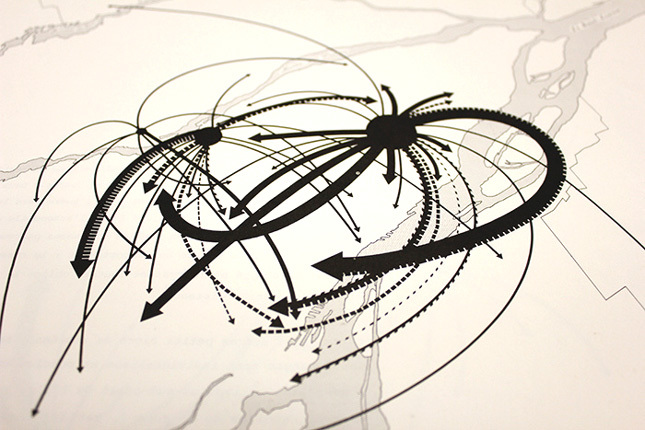 Photo Credit: “Les Migrations,” courtesy of flickr user Jodi Green.